Hotel Novotel Aachen City. Book your hotel now! Free Wifi! The Novotel Aachen is centrally located in the heart of the imperial city, just a few minutes' walk from the historic old town, cathedral and Eurogress conference center. The 154 rooms are air-conditioned, sound-proofed and very spacious, with free WIFI, sofa and tea/coffee-making facilities in an innovative design. The restaurant offers regional and international dishes, along with the bar and large sun terrace. Relax in the steam bath housed within the fitness area, which looks out across the city. 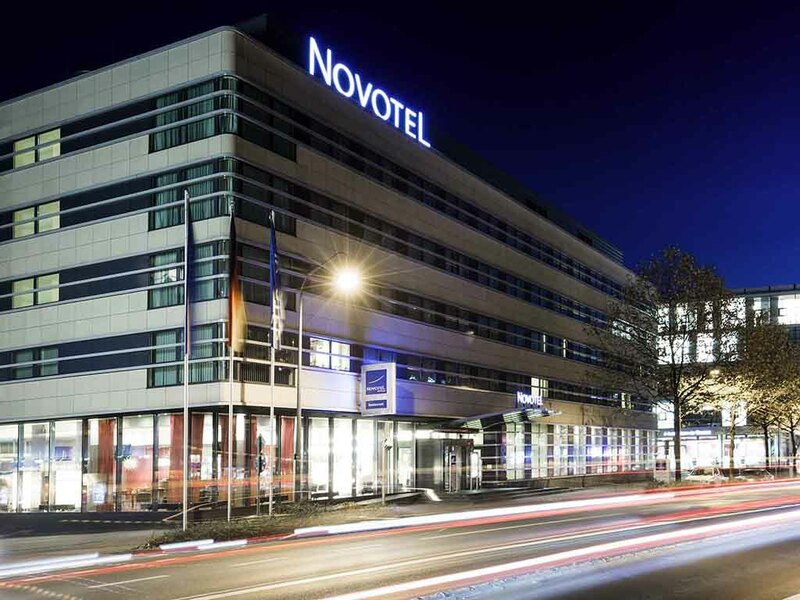 The Novotel Aachen City is situated in the heart of Aachen, making it particularly easy to reach. This stylish 4-star hotel has 154 spacious and air-conditioned rooms, featuring free WIFI. For your comfort, the hotel offers air-conditioned and spacious rooms, each equipped with high-speed Internet connection. Just a few meters away from the congress centre, casino and Carolus Thermen spa, the Novotel Aachen City hotel has all major attractions within reach. The restaurant opens at 6.30am for our breakfast buffet. Following breakfast, we serve both dishes from around the world and regional specialties through to midnight. The restaurant features a modern atmosphere and is air-conditioned. Our air-conditioned hotel bar is a popular place to wind down at the end of the day over a glass of wine or your favorite cocktail and chat to other guests. We are open every day from 11am to 1am and can seat up to 30 people. The location of novotel hotel is perfect. The center of the city is to reach within 5 minutes. The central bus station is across from the hotel. Parking is available in the under ground. Hotel stuffs are very friendly and helpful. Room is not big but sufficient and clean. The toilet is separated from the bath room and there is no possibility to wash, this is not comfortable. We stayed at this hotel to break up a car journey from southern Germany to the UK. The hotel itself was great: the standard rooms are a decent size with comfortable beds, staff were friendly and helpful, the breakfast buffet had lots of choice. We felt welcome as a family with a small child. The underground car park is convenient but not advertised on the hotel website so we had to rely on other guests' online comments to find it. Navigating the roads in central Aachen is a bit tricky and I would agree with previous commenters that the hotel is not situated in the nicest area, perhaps owing to the nearby bus station. Having said that, once you have parked the car, it is only a 10-minute-walk to the historic town centre so overall a convenient location. Would stay at this hotel again. Friendly reception staff and always help full. A very nice hotel in Aachen city center. The hotel staff was very friendly and helpful. The room, even though a bit small (but we knew what we were booking!) was enough for the whole family during a short stay. There is a very good breakfast for extra charge (kids don't pay) which was an excellent way to start your day. The hotel location is good, some 10 minutes walk to the old town and the shopping area. Regarding potential improvements, there only 2 minor things I noticed. In the room, the toilet is separated from the bathroom and there is no sink in it, which is inconvenient. Also in a standard room there isn't enough space to store your clothes when you unpack. Overall our stay was very pleasant and we would recommend this hotel. Overall I enjoyed the experience, the room was lovely and the staff were very friendly. I did find the breakfast to be expensive. I also had a meal at the restaurant which was great. In general it was a pleasant stay, and I would recommend it to others. The reception and bar staff are very welcoming and accomodating. We have received an upgrade without asking, which has never happened before for us in Novotel. Staff is customer oriented and friendly, room were clean and neat. Everything was fine with my stay at Novotel Aachen City. On my last evening, I had a dinner at the hotel's restaurant where i ordered a shrimp soup with coconut and lemongrass. After half an hour, i got a severe indigestion which caused me pain and discomfort for 3 days. I recommend staying at Novotel Aachen City but I would avoid the restaurant. It was again a nice stay at the hotel. The reception desk is always very attentive and helping us efficient and quickly. The bartenders are proactive and helping the customers to have a nice experience. The rooms are clean and well maintained. One item of feedback, please install more power sockets in the room, nowadays the customers have more smart devices than a laptop in the past. We had a smart watch, two smart phones and a laptop with us, not enough sockets. The hotel staff is always extremely friendly and helpful and are one of the main reasons I keep coming back to this hotel. The hotel was nicely located, rooms were of a good standard and clean. Staff were attentive and helpful. Worthy of special mention is the receptionist when I checked out. I left at 4:30 in teh monring and he kindly volunteered to get me a &quot;Coffee to go&quot;. On the downside. The checking in process was a little slow. The stairs down to the car park smelt of drugs, one morning I had to step over somebody in the stairwell who was clearly about to heat up drugs on a piece of foil, or had just done so. Found the staff very rude - one exception Saskia was amazing! Saskia went out of her way to help, she was brilliant. There was a lady called Kira at reception who was rude when I checked in. There was also a couple of staff in there restaurant and the bar on the saturday 22 december and I asked for a jug of tap water. There were very rude and refused to serve us tap water they said that they could only do bottled water but would do tap by the glass. Find this very odd I have never had this problem before in Germany. Their attitude put me off eating there again.